Mumbai: India’s large foreign exchange reserves are helping keep its ratings outlook from being downgraded, but a widening fiscal deficit and outflows from its stock market are warning signs, Fitch Ratings Inc. said on Monday. 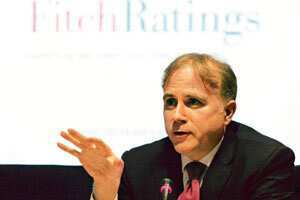 James McCormack, managing director of Asia-Pacific sovereign ratings at Fitch, said that India’s low level of exposure to global capital flows compared with other regional economies was also shielding Asia’s third largest economy from the worst effects of the global financial crisis. “Capital outflows from the stock market is making the economy vulnerable, but its high level of foreign exchange reserves has meant that its economy is in a better shape than some of its Asian peers," McCormack said in a telephone interview. India’s foreign exchange reserves hit a record of $316 billion (Rs14.95 trillion) in late May, but have since fallen by around a fifth to $252 billion at end-October as the central bank stepped up its dollar selling to prop up the rupee. On Monday, Fitch affirmed the country’s “BBB- minus" rating for both local and foreign currency debt, the lowest investment grade rating, and kept the outlook on its local currency rating outlook at negative and foreign currency outlook at stable. Fitch downgraded ratings for four eastern European countries to below investment-grade, and revised its outlook on a handful of emerging markets including Malaysia and South Korea due to the adverse impact of a looming global recession. A low level of global trade integration, relatively sheltered bond and currency markets, and sharp declines in global commodity prices, including oil, which reduced pressure on the trade deficit and the rupee, were favourable for India, McCormack said. Nomura Research said Indian exports comprised 22% of its GDP, compared with an average of 52% for the Asian region ex-Japan. Fitch said India’s fiscal position was a concern for its local currency rating outlook and warned any sharp slippages may prompt another rating review in the coming months.